The really frustrating thing is that air leakage has more to do with pressure than with temperature, so the stack effect actually reverses in the summer, pulling warm attic air into your home as cool air escapes through foundation leaks. 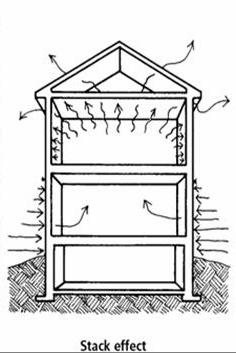 Managing the stack effect involves sealing the tiny leaks and cracks that allow uncontrolled air movement. Little highways of hot air (or “chases”) can be found throughout your house and often include plumbing and electrical penetrations, cracks in the ceiling, ventilated recessed lights, and even the joints in your attic where wall studs and beams meet sheetrock or plaster. Targeted air sealing, especially in the attic and basement, is the best way to control the stack effect, keep conditioned air inside, and ensure year round comfort and efficiency.